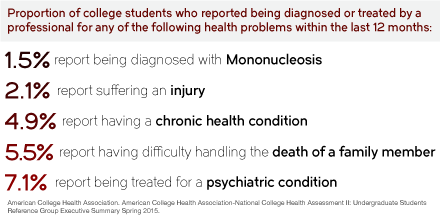 As students report to college this year, families are advised to take note that the growth in student health incidents & low awareness of college refund policies create a precarious position for college families. 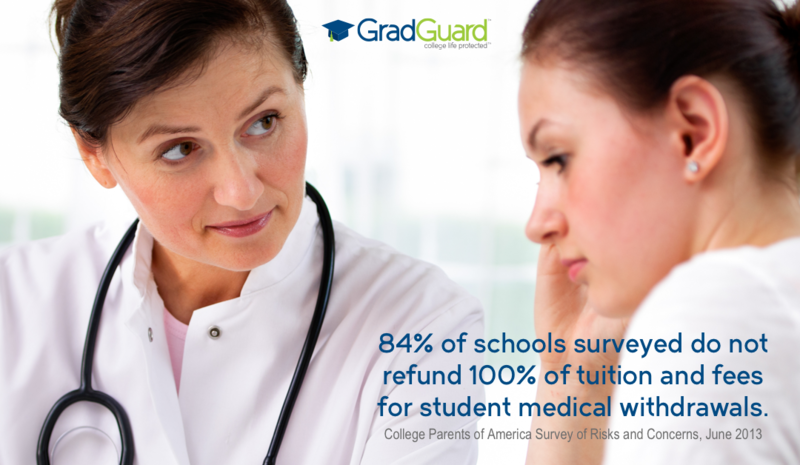 As a result, college families may benefit from tuition insurance available through GradGuard. 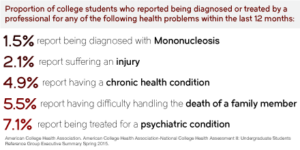 The American College Health Association National College Health Assessment from 2010 – 2015 reports a dramatic growth in student reported incidents of the following illnesses. 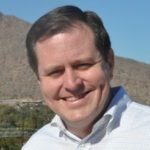 According to John Fees, co-founder of GradGuard, an authority in protecting the investment of college students and their families in higher education, “families are often aware that their college student may be vulnerable to the stress of college life but it is important to note that ordinary student health problems such as a mononucleosis, chronic health conditions or injuries also may force a student to withdraw from classes and cost a student and their family thousands of dollars. 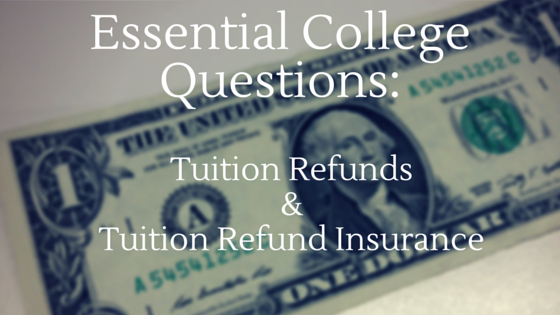 Supporting a college student through an unexpected event can be stressful and it is made worse if parents are not aware of the college refund policy. A 2016 survey by College Parents of America indicates 71% of parents do not recall being informed of the university refund policy and 67% of parents surveyed indicate that they have no idea how the school would handle a refund if their student was unable to complete classes. 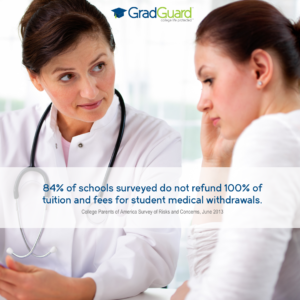 In fact, in a 2015 national survey of college & university bursars & health administrators, less than a quarter of schools reported providing 100% refunds. According to the survey, most schools only refund a portion of tuition for qualified withdrawals through the fifth week of classes and virtually no school provides a refund for the academic fees. Does your school provide a 100% refund for medical withdrawals? If not, can your family afford the potential financial loss? When does college start? If you want protection that reimburses you if your student has to withdraw from classes, then remember that tuition insurance can only be purchased prior to the start of semester. Starting at $29.00, tuition insurance can be an affordable form of protection for college students and families. Coverage and pricing may differ by school so check with your college or university or at GradGuard.com to find coverage that will protect your investment in college. Remember like all insurance, coverage is determined by the actual policy. A student must complete a medical withdrawal that is verified by the school. Some illnesses require proof that it was severe medical event. 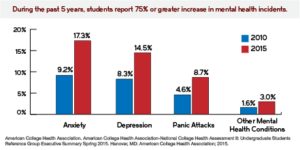 For instance, general anxiety isn’t sufficient but mental health issues that require hospitalization generally are. Check your policy for complete details as certain states and schools have unique requirements.